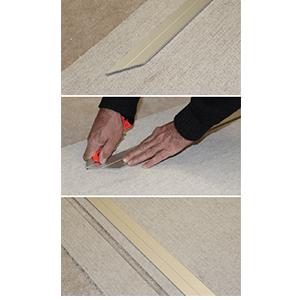 [Mississauga] Loxcreen announced its new and improved Sabre Tooth Straight Edge tool for cutting carpet, sheet vinyl and other flooring materials. According to the company, the tool is 2-1/4 inch wide and has deeper end grooves to prevent it from moving side-to-side once it sinks its teeth into the flooring material. Made of Loxcreen’s traditional extruded aluminum, with precise place holders, the straight edge will only move back and forth to allow the installer to cut the flooring material in a straight line up to 12 feet wide. The Sabre Tooth Straight Edge comes in clear anodized to prevent markings on the flooring material. This profile is now available for immediate shipment from the Loxcreen Flooring Groupmanufacturers to distributors and professionals in the flooring industry across North America, the company stated.